Hamilton Chan is founder of Los Angeles-based PaperLinks (www.paperlinks.com), a new startup which is developing mobile applications which take advantage of QR codes--the 3D barcodes which are cropping up everywhere--to help users marketers go beyond just linking those codes to web pages, but also to power social applications. The firm has a native, iPhone application which uses QR codes to drive user friendly, social modules for events, pulling up information, and much more natively in iOS. Hamilton told us how his experience in his family's old-fashioned, printing business spawned PaperLinks. 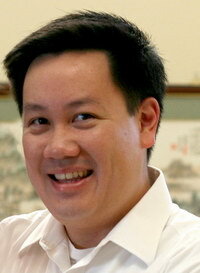 Hamilton Chan: PaperLinks' mission is to hyperlink the real world. My hypothesis, is that hyperlinks are migrating into the real world, and that the world is moving past the web browser on the desktop to retrieve information. Before, if you had a search query that you'd thought of in your head to look up, you'd have to go all the way back to your desktop to find that information. However, now, because smart phones are ubiquitous, there is Wi-Fi, 3G, and 4G widely available, people can get information while on the go. This presents an opportunity for people, businesses, and brands who have products in the real world and in retail storefronts, packaging, and advertisements, allowing people to get additional information from what they are already seeing out there. believe that mobile will be the quickest way for people to access relevant information. For example, you might see a leather chair in a hotel lobby, thinking that it would be perfect in your living room. The availability of real world hyperlinking--which is made possibly by QR codes--would allow you to scan the QR code on the back of that leather chair, and but it right from your phone, right then and there. You could get the price, learn more about that furniture, and figure out the retail outlets and stores that carry that chair. The same would apply to something like a bakery--perhaps, you could use QR codes on the packaging for cupcakes to contact the bakery, learn more about the history of the backer, or see other user comments on that cupcake. Information retrieval on-the-go is coming to a world near you, and PaperLinks wants to make that possible. How is it that you're doing that? Hamilton Chan: We provide a platform where brands can go and create a QR code. We help them generate, and have also launched a platform which allows people to pick modules using a drag-and-drop interface. It takes all of the complicated technology out of the equation, and makes it as intuitive as possible. Marketers can get a QR code in under five minutes. Right now, it's available as an iPhone application, and we're working on Android. Our application is a QR code reader, where you can read any QR code--not just one created through our platform. What we feel is particularly distinguishing, is we're providing the app. Rather than just showing QR coded content inside a web browser, we pull users into our app, which is a much richer experience. We seem to talk to lots of companies recently generating QR codes -- how is this different, and how do you get above that noise? Hamilton Chan: I think that the noise is good for all of us, and believe that a rising tide does lift all boats. I think we are pre-tipping point of where QR codes go mainstream. So, rather than seeing other people as competitors, we see them as complimentary in the same space. Adoption and awareness of QR codes is good for consumers, and good for advertisers. How we rise above that noise, is we offer the most intuitive product, and the one with the least amount of friction for consumers. The one big dropoff in lots of QR code campaigns, is that although you ask people to scan a QR code, users don't know which reader to use. We ask them to scan the QR code with the PaperLinks iPhone app, which makes the dropoff less of a risk for marketers, because users know what to do, what application to get, and that it is free. It's rated as one of the best reading applications out there. The other key differentiation point, is we offer businesses the opportunity to create a native app experience. The big difference is web pages load slowly, depending on the connection. By using Objective C on the iPhone, we have been able to tap into the iPhone API, and make things a quicker experience, but also provide utility and functionality not available to a web browser. What is the story behind the firm, and what's your background? Hamilton Chan: I really started in an entrepreneurial environment, ever since I was five years old, working at Charlie Chan Printing. It's an LA institution, which my parents started in 1969. I grew up in the business, but my parents never wanted me to focus on printing. I ended up going to Harvard for college, and worked at JP Morgan in investment banking, and went to Harvard Law School. I ended up representing people like Kobe Bryant, MGM, and others, but I realized I wanted to be an entrepreneur and that it is in my blood. So, 10 years ago and left to run Charlie Chan Printing. I know that because we were in the print industry, it was important to diversify and to be competitive in the digital age. As part of that, we launched a web site to allow people to order printing online, and we also saw the ability to use QR codes to augment that printing. Also, I think running a small business gave me a unique perspective of the small business owner, of small business needs and marketing issues. So, we talked with lots of our clients, the thousands who we've worked with to improve their marketing presence and who thought our printing was great, and encouraged them to continue their marketing, and why not marry the benefits of tangible prints with visual interaction. Was it difficult going from print to mobile application development? Hamilton Chan: It was exciting and thrilling. It breathed new life into our organization, because everyone wants to feel like they're working on the latest and greatest. There is definitely a feeling that printing is old school, and that modern times were passing us by. So, it's been very exciting for staff, and we hold weekly meetings to talk about what is going on with PaperLinks. We are incorporated as a separate company, but we're all in the same area. It was a natural transition for me, because I've always been interested ni technology, and I did computer programming when I was younger. Plus, I love the iPhone, the palm Pre, and I can't get enough of this. It's really fueled by my passion, and hiring the technical talent was just basically no different than any other position at company. What are you working on now with the service? Hamilton Chan: We are looking to launch our B-to-B platform by the end of this month. We've been integrating PaperLinks technology into our two e-commerce sites, Paperspring (www.paperspring.com) and Headshotbox (www.headshotbox.com), which allows people to order birth announcements, holiday cards, and birthday party invitations and put a QR code on the back of the invitation. We're also populating modules for content, opening up to businesses, allowing businesses to pick and choose modules that fir their business and leverage the technology. Our overarching strategy as a company is to make the QR code experience compelling. Right now, there are lots fo people who will create a QR code, which just goes to a desktop URL. That leads to a bad experience for consumers, and turns them off to the QR code. We want to make something exciting and engaging, so there is no question why they want to scan that QR or PaperLink code. Finally, what do you think will push QR codes over the tipping point? Hamilton Chan: I think there will be a national media moment, maybe sometime in the second half of the year--a total guess--which cause a tipping point to occur. It could be something like American Idol adding the ability to scan QR codes off a TV screen to vote, really anything to show people that QR codes are inevitable. I think what will make that happen is a broad based media effort--something in movies, TV shows, the Super Bowl--which will make everyone understand how the technology works and how you can use it every day.